This is just a quick update for everyone wanting to know what’s happening with AtlasMaker. I have a new version planned, but I’m not quite sure when it’s going to get done. I wrote AtlasMaker over a couple of evenings to save me time with an iPhone game project I’m currently working on and that is taking priority at the moment. The next version will hopefully contain the following features. More/better error handling and a more robust and informative interface. 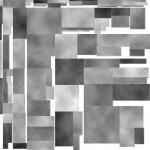 Several rectangle packing algorithms – choose the best one for your data. Improved export file: more data, bigger text box for xml fragments etc. You can choose the filename and location of the export file. Optional flattening of layers on the finished document. 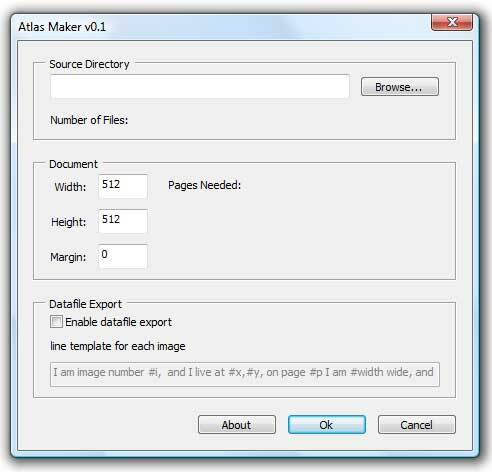 I was recently able to test AtlasMaker on CS4 (I developed it on CS2) and was dismayed by how slow it is in comparison. I managed to speed it up a bit by turning off “open documents in tabs”, but it still ran at a glacial pace. Let me know what you think. Would you prefer a slow Photoshop script, or a faster external tool? One of the most common and tedious tasks in 2D game development is making sprite sheets from dozens or often hundreds of individual image files. Back when I was making Starblaster, I laid out several hundred sprites by hand. It took many, many hours and severely restricted my ability to experiment with different graphics. It’s even worse these days since most sprites use alpha channels; the semi-transparent images are almost impossible to line up by hand, and some particle effects are practically invisible unless they are laid on a dark background. For my latest project (more info coming soon!) I decided I’d had enough of this drudgery, and wrote a Photoshop script to do the job for me. SpriteGrabber will take a directory full of image files and lay them out for you on one or more sprite sheets. Additionally, SpriteGrabber can export a text file containing information about each sprite. You can use this feature to generate calls to whatever function you use to load the sprites in your game. To run the script in Photoshop just go to File->Scripts->Browse and load the SpriteGrabber.jsx file from wherever you downloaded it to. It will run automatically and present you with the interface above. Click “browse” and select the directory containing your sprites. SpriteGrabber will now process the directory and work out how many valid image files there are and how big the sprites are going to be. If you have different sized images in the directory, SpriteGrabber will use the largest dimensions to determine the sprite size. Once the images are processed, the script will work out how many rows and columns there’ll be per page and how many pages will be needed to hold all the sprites. You can adjust the document width and height to alter these properties. Once you are happy, just click “Ok” to generate the sprite sheets. 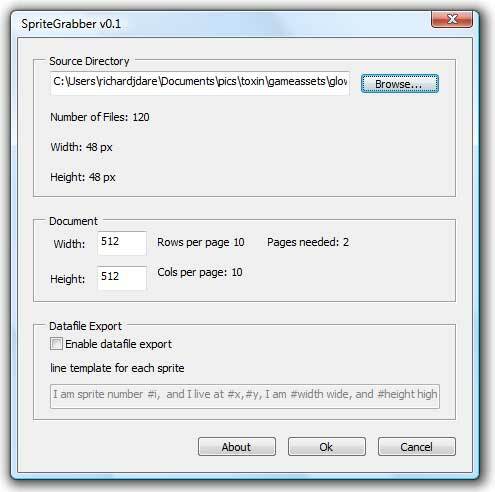 If you tick the “Enable datafile export” checkbox, SpriteGrabber will create a text file in the src directory called “SpriteInfo.txt”, containing a line of text for each sprite. SpriteGrabber is not intended as a masterclass in Photoshop scripting. In fact it’s the first script I’ve ever written, but it should help trim a few tedious hours off the development process. Soon I hope to have a new version ready that will be able to efficiently arrange sprites or textures of any size. SpriteGrabber has been tested on Photoshop CS2,CS4,CS5 for Windows Vista, and CS3,CS5 for Mac OS X. Over the next few months I want to write something around the idea of a language of game design. I say “around” because the subject is so tricky that it doesn’t let itself be approached directly; it must be circled carefully, with a keen eye for the subtle tracks it leaves in the gaming landscape. Glimpses of our prey are fleeting; a movement in the long grass, the flash of an eye in the shadows. It’s a beast that none have seen clearly, yet tales of it are told wherever its hunters gather. What do we mean when we talk about a language of game design? Over the past ten years, many designers have had the intuition that it might be possible to create a notation for describing game ideas like those that exist for music and choreography. Although the idea has been floating around for a while, it came to prominence in 2005 when Raph Koster delivered his lecture, “Game Grammar” at the GDC in San Francisco. Since then, many more game developers have started to explore the idea from a variety of perspectives, and for a variety of reasons. But to talk of a language may ultimately mislead us. It’s important to keep in mind that we are using the word “language” as a metaphor. We might as easily say a mathematics of game design, a biology, or an architecture. Each of these designations points toward what we are looking for, but the contours of their meanings may scatter the light in other, less helpful directions, just as they reveal new and novel ones. The search for an ontology raises some interesting questions. How are game entities similar to or different from their counterparts in the real world? How is creating a language of game design different from creating a language of surgery, of truck-driving, or of tasks and events in general? Given a real world-system of entities, a supermarket say, or a cowboy’s corral, what do I need to add or take away to make it into a game? The central question, for me anyway, is not how I might write down my game ideas, or lay out their anatomy, but how do I see a game in what is around me or in what I feel? An artist looks upon his subject and sees form, colour, line and space. What does a game designer see? How can I teach someone to see it? The posts in this series will be fairly loosely linked. I don’t have a grand unified theory or anything like that. I just want to share my thinking and get my ideas out there to anyone who might find them useful.